To get to other parts of the page quickly, you can use this quick menu. Otherwise, if you are looking for an overview of resources on throwing weapons, give the page a once over from the top, or try the Index to Thrower! Spears, Atlatls, and other arrow throwing tecniques! You will see some nice pics of both the Nulla Nulla and Atlatl here. Here's a comment on African throwing weapons from fearless thrower Phil West featuring Buffy looking like she means business! 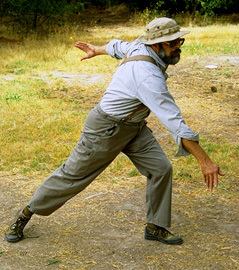 Thrower participants have, collectively, a wide range of experience with many primitive weapons. As it happens, knives occupy 90% of the discussion taking place on the thrower mailing list (see below). We talk about choosing a knife, the economics of throwing, making throwers (including steel sources like Admiral and Metal Mart for smaller quantities), caring for them, throwing (how to), clubs/organizations, competition throwing, hunting/survival, as a facet of martial arts/self defense training, and even finding them when they're lost! There are a growing number of other articles to read on this web page in addition to all the links above. (see below) covering such topics as stances, throws, grips, custom and off-the-rack knife makers, catalogs, books, and other resources like these nice throwing knives from Flying Cloud Trading Co., This page of axes from Jason Townsend & Son including their "French Throwing Axe", and this modern reproduction of the ancient Roman BATTLE DART along with a first hand report of one member's experience with it. Over here, a web site from Bailiwick Enterprises hosting a whole range of throwing products, Doc Gundersen's L & H Knife Works, Throwers from Bobby Branton, and a pointer to the most famous thrower of all... THE VIPER!, not to mention some throwing fun with our Russian friends from SPETSNAZ. Here are two sources for custom molded Kydex sheaths for your throwers, one from Blade Rigger, and the other from Blade Tech. If you prefer more of the do-it-yourself approach, you might find appropriate supplies at SNAP Company Of course there is a whole world of information on LEATHER out there if that is your preferred sheath medium. Click to subscribe to thrower. To unsubscribe, go back to Yahoo!, sign in to your account, pick the thrower group and then choose unsubscribe. If you do subscribe, be prepared for some mail in your mailbox, and please pay attention to the UNSUBSCRIBING instructions sent to you in an introductory message. Remember that the subject matter covers all manner of thrown objects for sport, martial-arts, and even hunting. In an effort to bring you the latest in technological innovations, I have also created a THROWER discussion forum using EZBoard an interesting new and so far free web technology for creating conference communities. Feel free to hop on over and check it out. You must be registered to post, but anyone can read. To register, just click on the REGISTER link near the top of the page... Its easy and fun! The links below will lead to even more resources on the subject of knife throwing. The text of Custom contains a list of by-hand knife makers that specialize in throwing knives. There is also a pointer to an atlatl maker. The text of Books contains a list of book and video resources on the subject of knife throwing. The text of off-the-rack contains descriptions of the knives I obtained from various mail-order catalogs. The Lee Larae Knifecenter has some of these on display here, but the best collection of all seems to come from the Sunshine Knife Outlet in Florida! The text of my custom knives contains descriptions of the knives I own from the makers in the CUSTOM file above. The text of CATALOGS contains a list of mail-order catalogs containing throwing knives and other throwing weapons. My TARGETS contains a discussion of various target materials and target construction techniques. Throwing knife GRIPS, a pictoral index. Make an ON-THE-BACK SHEATH to hold those throwers! An article by Scott K. Robinson. An article about the "Master of the Blade", Bob Karp, by Gene Hauenstein which first appeared in a 1996 issue of Tactical Knives Magazine. Here is a short article about making a simple, indestructable handle for all steel throwing knives. I have some pointers to periodicals that sometimes have articles or other information about knife throwing. The Garvin text contains a few examples of throwing from Peter O'Donnell's Modesty Blaise. Here also in a link to an interesting page about throwing cards that may not be around all that long, so check it out while you can. It relies a lot on the book Cards As Weapons by Ricky Jay, now out of print, but listed in our books page nevertheless. The American Knife Throwers Alliance, A.K.T.A. a club with a quarterly newsletter, some dues ($20/yr), that sponsors knife throwing competition including a national event annually. Best thing is that membership includes a nice patch, a 10% discount on Lowcountry Throwing Knives, Harald Moeller's VIPER throwers, and throwers by knife maker Lee Fugat. You will find an introduction to AKTA competition rules here. is loosly affiliated with the AKTA. It uses the same basic format in its competition as does the AKTA national event (see COMPETITIONS below). Contact Rick Lemberg at (408) 996-0685 for information. Membership is $20/year. Membership is required to compete in the annual regional. There is also a quarterly newsletter. is another club. This one fostered by Bob Karp. There is a national event held in Phoenix in March. See COMPETITIONS below for details. The IKTA competition is much different from its AKTA counterpart. Please see this page of competition rules for an overview. (if I can find an email address I'll post it). also have throwing knife competitions as a part of their meets. 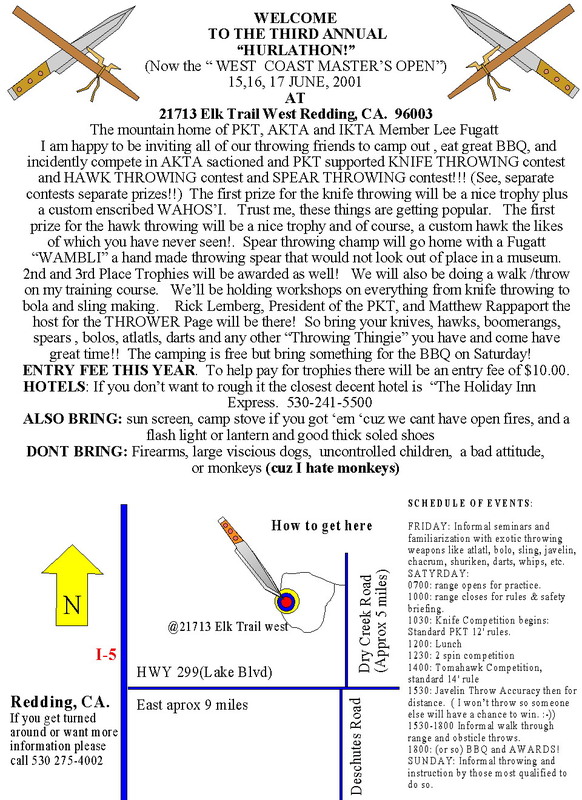 the hawk and knife competition. There is a $1000 first prize in each category! Sponsored by Media 50+ Corp. Sponsored by IKTA 1998-99 World Champion Lee Fugat! June 15,16,17, 2001 at 21713 Elk Trail West. PKT/AKTA style contest on Sat. June 16. Major event for all kinds of throwing implements, oriented towards primitive weapons, demonstrations, classes, and vending. Vending fee $25 waived if you do a demonstration! STICKING POINT by Tim Valentine. Focusing more exclusively on knives... Good illustrations, keeps up with U.S. competitions. Good instructions, and other things too. Web references into knife and axe throwing are growing. Try this page of Scott Gracia's, the "Great Throwzini", While over here is the Great Throwdini! Confused yet? Over here, SteelFyre shows us his knife throwing act, while Christian Thiel has one for German throwers, and he's translated his entire page system into English as well, very nice! While we're in Germany, check out this great new knife and axe throwing page by Norbert C. Maier! More bi-lingualism at Hugo Gonzalez's Knife Throwing in Spanish page! Back in the U.S., Jason Chasse has a developing page here. Jeff Koch does a really nice job of showing us how a throwing knife can be made on his page. Thrower list reader Rich uses Java Script to pull in his page, so I can't even point you directly at it (not all technology is good). Just go here and click on his "Knife Throwing Links" for an interesting viewpoint on the subject. You can submit your own url to many search engines using this link.